Fungus Amungus is a recent toy line in the ilk of Trash Pack, featuring gross, one-inch tall critters called "Funguys." The Funguys are supposed to be germs, bacteria, molds, spores, and the like in the form of monstrous little creatures. The line debuted in 2016 from a company called Vivid Imaginations. 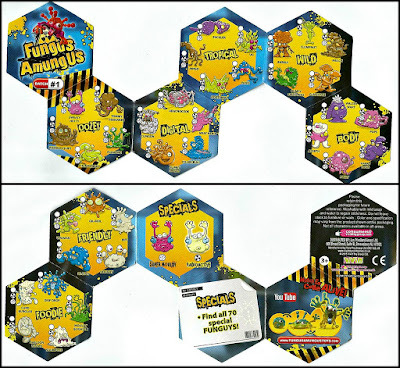 After years of being poked, squashed, stretched, examined and contained by The Bio Busters the Funguys have had enough and escaped into the human world, causing all sorts of mayhem. With The Bio Busters hot on their heels, the Funguys have taken to hiding in all sorts of weird, wonderful and sometimes disgusting places! The three things Funguys hate most are dusters, washing machines and most of all The Bio Busters! Can you help the Bio Busters capture these bacteri-urgh? So far, two series of Funguys have been produced, though I believe the second series has so far only been released in Europe. 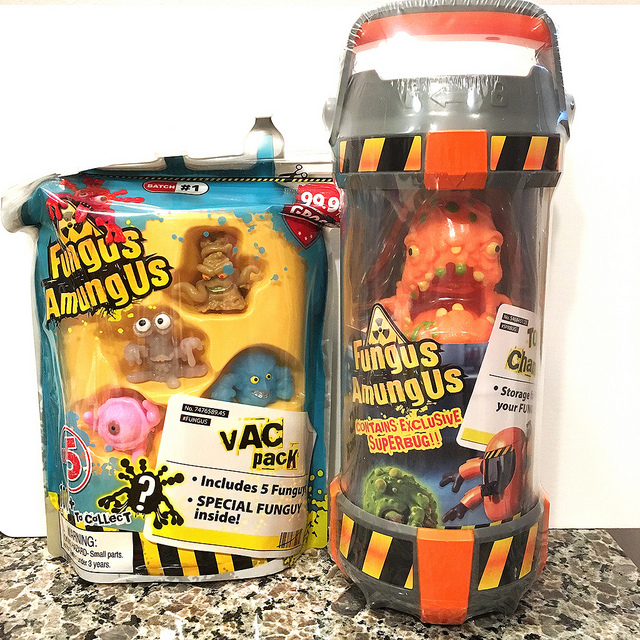 I picked up a Funguy five-pack as well as the Toxic Chamber. I absolutely love the designs and sculpts of these figures. They are very creative and well done. My one complaint--and it's a pretty big one--is that all the Funguy figures are stretchy and sticky. This gives them a cheap, disposable feel. They would be so much better produced in firm rubber, or even the non-sticky squishy rubber of Trash Pack. If they weren't sticky, I would definitely be trying to complete a full set. Fortunately, the larger Superbug figure is not sticky, but made of a regular soft rubber. In my opinion, the Superbug is the best part of this whole line. It's an awesome little weirdo! In addition to the orange shown here, I believe it's available in green and yellow versions. I'm a fan of this line based on the high quality of the sculpts. 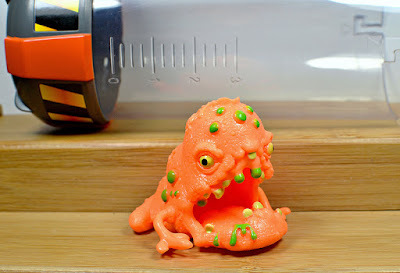 The fun designs are reminiscent of the excellent 1980s Germs toy line from Worlds of Wonder, which featured larger rubber germ creatures that came in plastic test tubes. I only wish Vivid Imaginations would release non-sticky, firmer rubber or plastic versions of all the figures. I get that the stickiness probably appeals to some kids, but if they weren't sticky I think the line would attract a larger number of older collectors too. What's your take on Fungus Amungus? Have you picked any up yet, or do you plan to? I own quite a few of the figures from this toy-line. Unfortunately, I haven't opened any of them yet. I like to photograph all of my toy packaging before I open it, and I have a huge backlog of such toy photos to take. I also like to keep my toys sealed in order to protect them from smoke, dust, and pet hair. Because I haven't opened any of my Fungus Amungus figures yet, I wasn't aware that they were sticky until I read your article. Even though I haven't opened mine, however, I could still tell how soft the rubber is: disappointingly soft. ("That's what SHE said!") In fact, these appear to be so soft that I have my doubts about whether some of the sculpts could even stand upright. I'd appreciate any information about whether that hunch is correct (which I assume it is). The reason that this toy-line is so soft is the same reason that the Trash Pack and Grossery Gang toy-lines are almost as soft, and the exact same reason that the Monster In My Pocket toy-line is fairly soft. 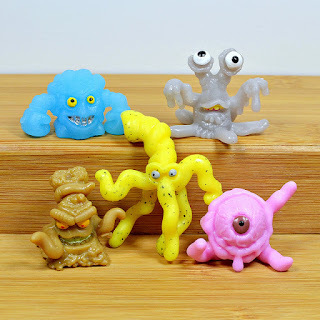 Namely, all four toy-lines are squishy because all four line are supposed to be gross (or, in the case of MIMP, gross and/or scary), and squishy figures are more gross than firm figures. In fact, MIMP's original tagline was "They're squishy!" (although apparently this tagline was unpopular, because it was discontinued fairly quickly). Regardless of Fungus Amungus's over-the-top softness and their apparently stickiness, I INSTANTLY fell in LOVE with their sculpts! Like you, LittleWeirdos, I specialize in small figures of monsters and other creatures. The sole difference between us is that I like painted figures at least as much as I like monochrome figures. And, regarding small creature figures -- especially painted ones, Fungus Amnugus is one of the best such toy-lines in the past several years. If the second series was only released in Europe, I wouldn't expect anymore series (sticky or otherwise) -- and I certainly wouldn't expect anymore series here in the USA. SUMMARY: If I were to assign this toy-line letter grades from A to F, including pluses and minuses, I'd give the sculpts a solid "A", but I'd give the material they're made of a "D-". Overall, I'd still give the toy-line an "A-". Constructive criticisms (take them with a grain of salt!)... In addition to (or instead of) the phrase "germs, bacteria, molds, spores, and the like", I'd recommend the word "pathogens" -- such as "pathogens: fungi, bacteria, viruses, parasites, etc." And instead of the phrase "color variations", I'd recommend the word "colorways" (or at least the phrase "color variants"). Your hunch is correct -- they are so soft that some of them do not stand up.